A collector’s edition FJ40, seeped in authenticity. 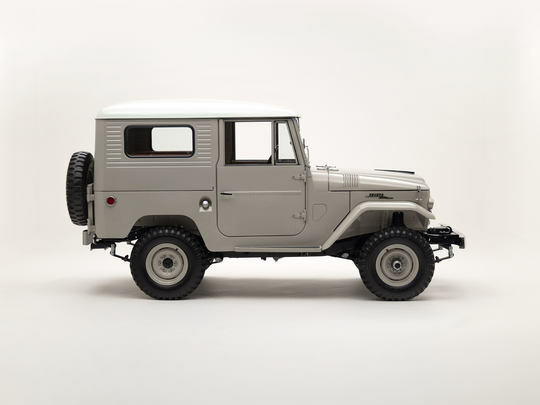 This early model FJ40 is a rare, collector's item equipped with parts that are nearly impossible to find. The original owner purchased this FJ40 at a Toyota dealership and was one of the few who opted for a hardtop with corrugated side panels. A manager of a shoe business, he used this Land Cruiser to transport products and supplies to and from the factory. In the 1980s, this FJ40 was procured by a collector who owned it for several years. The back end features small swing-out doors with a unique, rear hatch that can be pushed up and folded horizontally — the only foldable version available on these models. The original windshield ventilation cover was in perfect working condition (which is rare) and has been restored. Inside, you'll find plenty of exposed metal (typical of early model Land Cruisers) and seats trimmed in Saddle vinyl - just like the original. Every switch, gauge, and knob has been painstakingly restored or replaced with a new, original version of itself. One of the best things about owning a classic Land Cruiser is its time-honored durability. Under the hood, you’ll find the Toyota’s F engine — a formidable warrior with the familiar cast iron block and heavy-duty construction. Our shop performed a complete overhaul of this original engine, as well as the 3-speed manual transmission. The FJ40 was the first 40 series model produced by Toyota. The original was a soft top, which rolled off the line in 1960 — hardtops soon followed in 1961. Popular with enthusiasts, the FJ40’s rugged good looks remained mostly unchanged throughout its 24-year production run.